The North American A-5 Vigilante was a powerful, highly advanced carrier-based supersonic bomber designed for the United States Navy. Although its service in the strike role was very short, it saw extensive service in the reconnaissance role. Prior to the unification of the Navy designation sequence with the Air Force sequence in 1962, it was designated the A3J Vigilante. In 1953 North American Aviation began a private study for a carrier-based, long-range, all-weather strike bomber, capable of delivering nuclear weapons at supersonic speeds. This proposal, the NAGPAW (North American General Purpose Attack Weapon) concept, was accepted by the US Navy, with some revisions, in 1955. A contract was awarded on 29 August 1956. Its first flight occurred two years later on 31 August 1958 in Columbus, Ohio. Designated A3J-1, the Vigilante first entered squadron service with VAH-3 in June 1961, replacing the A-3 Skywarrior in the heavy attack role. All variants of the Vigilante were built at North American Aviation's facility at Port Columbus Airport in Columbus, Ohio, alongside the T-2 Buckeye and OV-10 Bronco. 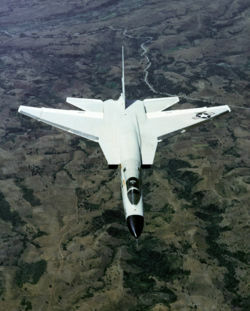 An overhead aerial view of an RA-5C Vigilante aircraft. The Vigilante's early service proved troublesome, with many teething problems for its advanced systems. It also arrived in service during a major policy shift in the Navy strategic role, which switched to emphasize submarine launched ballistic missiles rather than manned bombers. As a result, in 1963 procurement of the A-5 was ended and the type was converted to the fast reconnaissance role. The first RA-5Cs were delivered in July 1963, with Vigilante squadrons redesignated RVAH. An air-to-air right side view of a Heavy Attack Reconnaissance Squadron 3 (RVAK-3) RA-5C Vigilante aircraft. 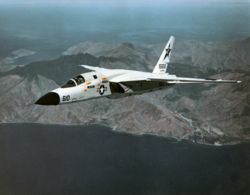 At the time of its introduction, the Vigilante was one of the largest and by far the most complex aircraft to operate from a US Navy aircraft carrier. It had a high-mounted swept wing with a boundary-layer control system (blown flaps) to improve low-speed lift, two widely-spaced General Electric J79 turbojet engines (the same as used on the F-4 Phantom II), and a single large vertical tailfin. The wings, the tail, and the nose radome folded for carrier stowage. The Vigilante had a crew of two seated in tandem, a pilot and a bombardier-navigator (BN)—reconnaissance/attack navigator (RAN) on later recon versions—in individual ejection seats. With a clean airframe and powerful engines, the Vigilante was fast at high altitudes, although its high landing speed made returning to the carrier a challenge for inexperienced or unwary pilots. It was surprisingly agile for such a big and heavy aircraft. The Vigilante had extremely advanced and complex electronics. It had one of the first fly-by-wire systems of an operational aircraft (with mechanical/hydraulic backup) and a computerized AN/ASB-12 nav/attack system incorporating a heads-up display (one of the first), multi-mode radar, inertial navigation, closed-circuit television camera under the nose, and an early digital computer known as VERDAN (Versatile Digital Analyzer) to run it all. Although this system was highly sophisticated, the technology was in its infancy, and its reliability was poor. In early squadron service the system's MTBF (Mean Time Between Failures) was only 15 minutes. Although some bugs were worked out, the aircraft remained a maintenance nightmare throughout its career. The Vigilante originally had two wing pylons, intended primarily for drop tanks. Its main armament was carried in a novel linear bomb bay, a cylindrical bay between the engines in the rear fuselage that carried a "stores train" with two disposable fuel tanks attached to a single nuclear weapon, commonly the Mk 28 bomb. The idea was for the fuel tanks to be emptied during flight to the target and then jettisoned as part of the bomb by an explosive drogue gun. In practice the system was never reliable and was often dangerous. The stores train sometimes dropped out during catapult launches, leaving the fuel cells and weapon on the flight deck. It was also prone to 'trailing' behind the aircraft in flight. Even later in the Vigilante's career, when the bay was used solely for fuel, the arrangement often proved troublesome. The second Vigilante mark, the A3J-2 (A-5B) added blown flaps on the leading edge of the wing, heavier landing gear, and a pronounced dorsal "hump" incorporating tanks for an additional 460 gallons of fuel. Two additional wing hardpoints were added, for a total of four, although in practice they were rarely used. The reconnaissance version of the Vigilante, the RA-5C, had slightly greater wing area and added a long canoe-shaped fairing under the fuselage for a multi-sensor reconnaissance pack. This added an APD-7 side-looking airborne radar (SLAR), AAS-21 infrared linescanner, and camera packs, as well as improved ECM. An AN/ALQ-61 electronic intelligence system could also be carried. The RA-5C retained the AN/ASB-12 bombing system, and could, in theory, carry weapons, although it never did in service. Later-build RA-5Cs had more powerful -10 engines with afterburning thrust of 17,900 lbf (80 kN). The reconnaissance Vigilante weighed almost five tons more than the strike version with almost the same thrust and an only modestly enlarged wing. These changes cost it acceleration and climb rate, though it remained fast in level flight. RA-5C Vigilante, b/n 156608, from Reconnaissance Attack Squadron 7 (RVAH-7) during what may have been its final flight in 1979. Several Vigilantes are currently stored or on display in the United States. RA-5C s/n 156621 was formerly on display on the USS Intrepid Museum in New York City. In 2005 the aircraft was acquired by New York State Aerosciences Museum (ESAM) in Glenville, New York. The aircraft suffered minor damage to its fuselage aft of the wing root while being moved from the aircraft carrier to a barge while supported by slings and is currently undergoing restoration for display. RA-5C s/n 151629 is on display at the Fred E. Weisbrod Museum/International B-24 Museum in Pueblo, Colorado. RA-5C s/n 156624 in on display at the National Museum of Naval Aviation in Pensacola, Florida. 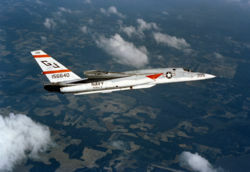 RA-5C s/n 156643, the last Vigilante built, is on display at the Patuxent River Naval Air Museum in Patuxent River, Maryland. It was transferred from Key West, Florida, and is displayed as a test aircraft operated by the Patuxent River Flight Test Division in the 1970's. RA-5C s/n 146697, the oldest Vigilante on display, is a gate guard at Naval Air Station Patuxent River, Maryland. RA-5C s/n 149289 is on display at the Pima Air & Space Museum in Tucson, Arizona. It was transferred from Davis-Monthan Air Force Base. RA-5C s/n 156612 is on static display at Naval Air Station Key West, Florida and serves as a gate guard. RA-5C s/n 156638 is on display at Naval Air Station Fallon, Nevada. It was transferred from Naval Weapons Center China Lake. RA-5C s/n 156632 was recently placed on display in Sanford, Florida as a memorial to Vigilante crews. It was transferred from Naval Weapons Center China Lake. RA-5C s/n 156608 is on static display at Naval Air Station Memphis, Tennessee. RA-5C s/n 156641 is on display at the USS Midway Museum in San Diego, California. RA-5C s/n 156640 is currently in storage at the Naval Weapons Center China Lake. YA3J-1 : Prototypes, two built. On 1960-12-13, Navy Commander Leroy Heath (Pilot) and Lieutenant Larry Monroe (Bombardier/Navigator) established a world altitude record of 91,450.8 feet (27,874.2 metres) in an A3J Vigilante carrying a 1,000 kilogram payload, besting the previous record by over 4 miles. This new record held for over 13 years. This page was last edited on 5 March 2007, at 08:28.